For junior Bryce Odegard, the Western game will probably be remembered as his best game as a Trojan to date. 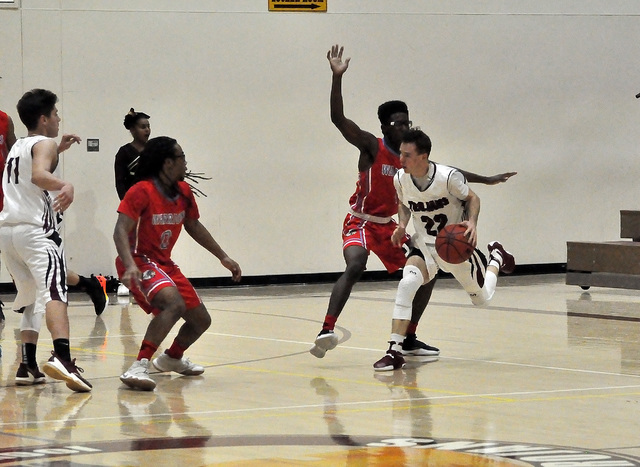 Odegard shot two 3-pointers in the third quarter and two in the fourth to help Pahrump edge Western 58-54 in a nail-biter. Horace Langford Jr. / Pahrump Valley Times Senior Nick Harris tries to stop a Western player from scoring in the first half. The Trojans put themselves in a 28-15 hole in the half, but then turned their defense around in the second half. Horace Langford Jr. / Pahrump Valley Times - Bryce Odegard avoids defenders in an attempt to drive the ball into the key. He took a half to warm up and in the end sunk four 3-pointers in the second half to help his team edge Western 58-54. Horace Langford Jr. / Pahrump Valley Times Trojans coach John Toomer gets his team fired up during the Western game. In the fourth quarter, Odegard hit a 3-pointer to tie the game at 42 with 5 minutes, 37 seconds to go. Then with 3:53 left he hit his last 3-pointer to make it 47-44. He had four 3-pointers for the game, all in the second half. Odegard had to warm up to those 3-pointers in the fourth for he started the game off cold, so cold he attempted two 3-pointers in the first half and got nothing but air. Trojans coach John Toomer said he kept it simple at halftime. The Trojans defense did just that, holding the Warriors (6-14, 2-3) to just 10 points, while their offense scored 23 points in the third quarter. Antonio Fortin had a 14-point game, with nine of his points coming in the third and fourth quarter. 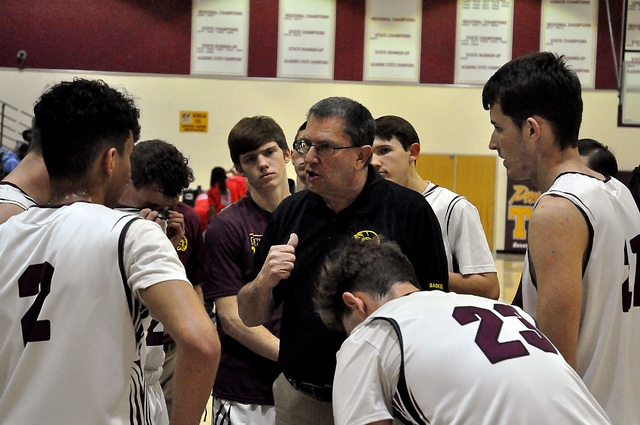 Fortin had said before the game that the team had to play harder in the second half and have more than one person in the double digits scoring and that’s just what Pahrump did. Odegard had 15 points and Parker Hart had 13. Another contributing factor to the win was the free-throw shooting. The Trojans shot 13 of 19 from the line for 68 percent. In the end, the game came down to free throws. The Warriors did have a chance to win the game in the final seconds but fouled the wrong player, David Sidhu, with 16 seconds on the clock and a two-point lead, 56-54. Sidhu calmly sank two free throws in a row to ice the game. 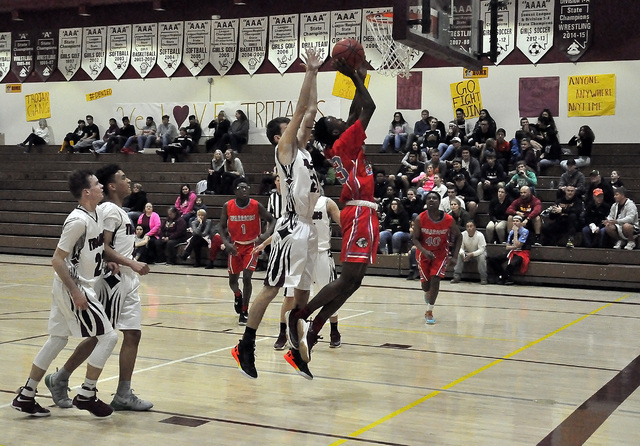 This was the first Trojans on-the-court league win since the 2013 season, when they beat Western. Last year the team did have a league win but it was due to a forfeit. The big difference between the last three years and this year’s team is the win column. This year the team has seven wins, which is more than what the Trojans had combining the wins for three seasons, which is six wins. The Trojans host Boulder City (7-14, 1-5) tonight at 6:30 p.m.